My first professional stage play commission, for Tynemouth Pageant, performed outdoors in the spectacular grounds of Tynemouth Castle and Priory perched on its sea-lashed headland. 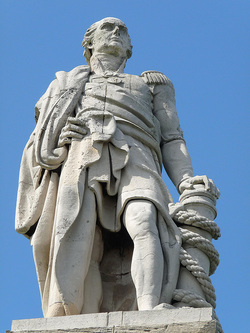 I attempted to give Admiral Cuthbert Collingwood the credit he deserves for his crucial role in and after Trafalgar, as he's been somewhat put in the shade by his colourful pal Nelson! I also told the stories of the Tyneside sailors(some of them women), their hardships and dangers, and how they were preyed on by the press gangs with tragic results - the women rioted on the quayside and attacked the press officers. I wrote some roistering songs for this play! Comedy, tragedy, terror, adventure and the battle of Trafalgar, it's all there!